Items visible on the image, in no particular order: Folded laundry, a teddybear my daughter got for free on a garage/carbootsale market last week (rommelmarkt), I got that tin basket there as well which I didn’t intend to use as I use it now , but this use suits me just fine ofcourse. In a post of another WOYWW-er she mentioned a place for her acryllic blocks. Great idea! And great ideas are there not to be reinvented but to be used, right?! So I try to store my acryllic blocks there. No more searching for that tiny block. Also on the board, a breasfeeding schedule – I feed on request but sometimes it’s nice to have some guidance as to how much should he get, also because next monday he’ll be going to the daycare for the first time and I need to bring along enough milk. Thanks to Anja from Artefaktotum I ran off from the computer (and chores) this afternoon to make these. Fun! Between making these backgrounds (1 or maybe 2 at a time) I experimented with mod melts. (More on that later. Someday, I’m sure). Oh what a horrible picture I see now… you can’t really see the great effect and nice colours. Zoom! Ah there, see? Better. Two cards with just acryllic paint and some glimmer mist. The texture is only paint. I intend to use the brown one for the Chocolate Baroque colour challenge. No idea how yet, something with gears? It’s a bit standard to do with brown background maybe. (Actually it’s antique gold and antique bronze). Then, later this evening when I got back to the computer, I got distraced by building a blinkie for Ryn from Designs by Ryn because she liked that I place a “badge” on the sidebar. It wasn’t really a badge, the text was too small and off center, and maybe if I add some more information about her products, and hmm add some bits of this and that and why doesn’t it work like I know it should? Let’s search online, and try this, and tadaa! Now surprise her, darn, I tossed the mail away accidentally after working on it for 30 minutes. There, rewritten now add the image.. wait… edit it a bit… then done. Ooh is that the time?! Hey, it’s Wednesday, time for a WOYWW post! Argh I forgot – Thank you Julia for hosting this fun event! Anyone with a crafting space (or workspace) can join! Time for another WOYWW, hosted by Julia from Stamping Ground. Nothing to win, nothing to make.. then what is it about? Hop over to her blog and find out. This is how much of my stuff is stuffed away. Most frequent used things are on the front half of 3 shelves, the rest of the space is for less frequent used things or non-craft related items. The brown binders and the green in between contain my stamps. Having taken many things out, put the card I want to work on ready, pull the box with baby close (wheels beneath a box are very usefull!) and get crafting! Oh and those curtains are still from the previous owners of the house, we haven’t had the time/energy/budget to have new ones made. On the front of the house we could put up our old cream coloured ones, but they were not wide enough for the back windows here. What does that turn into during crafting? Other stamps are from De-Stempelwinkel and the embossing folder is the Oceanthingy Spellbinders M-bossability. Steampunk and Art Deco/Art Nouveau go well together, I still have tons of ideas for it! *scribbles on wishlist: Rusty Hinge Distress Stain, can’t believe I don’t have that yet! Not really sharp picture, sorry. I’m assembling the alluminum foil card with flowers from Chocolate Baroque. I love how they turned out, with glitter, glossy accent, glimmer mist spray copper (or didn’t I use it?) and stickles. There are little Mod Podge Mod molds (or what is their name) shapes to see if they fit on the card.The two plastic boxes (one is an icecream box from Hertog) contain diecuts or fussy cut stamp images which I eventually didn’t use on projects or which I made extra. The mod molds have a plastic box of their own. (They are made with Martha Stewart clay, a tiny bit of ink, chalks and perfect pearls powder). It looks like this from a distance: (yup my drawer with distress inks on the table – it moves around kind of randomly but is always near me but hardly in the cabinet when I’m crafting. My son and I made the birdhouse. Or rather, I traced and cut the template, he stamped 3 times and then put the acryllic block with ink on it, then I stamped some more and glued it together. Hope you’re having a crafty week too! Oh and darn Julia for being so enthusiastic about the Quietfire stamps – my order is on it’s way now! (For other Dutch readers: my experience with shipments from Canada which fit through the mailbox is quite good, it allways arrived within a week. Watch out with “inklaringskosten” though – if the value of the goods is written on the package and is above €22,- (about 30 CAD) then you have to pay those service costs, which are between €13,- to €18,- which is quite a lot! Anyone else giving the Quietfire team a boost in their sales? Time for another WOYWW, hosted by Julia from Stamping Ground. Curious what it is about? Hop on over to her site! This is what my desk looked like after 1 1/2 hour of crafting (I did clean up a bit in between as I didn’t have space). This time I didn’t keep my crafting area clear, usually I put down a bigger cutting mat and try to keep that clear of stuff so I have room to do the actual crafting. Not this time, I just wanted to make some simple things, envelopes, and decorate them with a stencil and some distress ink – nothing fancy – so figured I didn’t need that much room. What’s on there: A card of aluminium foil and a “copper” frame, heattool, distress markers, empty teacup, distress ink, embossing powder, can of paintbrushes, box of glue related things and things that aren’t glue related (you know, other things like a small package of brads, and just… little things in packages that I might use if they are on my table, but definetely won’t use if I put them out of sight). (Putting them on my table isn’t helping). What’s more on there: a tin can with my childresn crayons which I confiscated. They rarely used them (in the Netherlands, children colour more with pencils (potloden) or felttip markers (viltstiften). 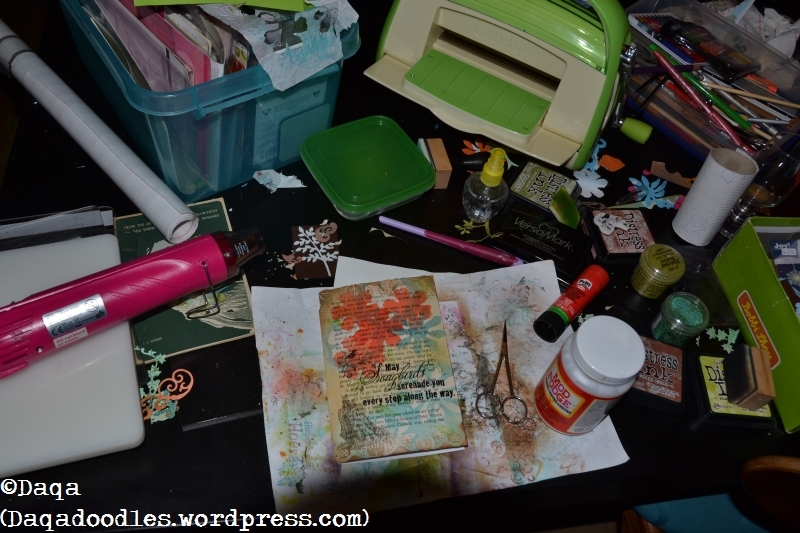 On top of it is a spray can of sealer which I have never used yet, then you can see a binder in the back with some of my stamps, and on the right a drawer with my distress inks in it – I always just get the drawer out and put it on the table / chair. Oh I forgot my wellbeloved spraythingy – unfortunately it got loose again so I’ll have to fix it, but need to fix it so it won’t leak this time. (The previous fix was putting the spray top on the glass jar because the original orange spray jar broke). [Oooh what a coïncidence, in that post is also the quote I have referred to a few times lately! ]Oh, and those heart stickers on there: They have kind of become my pincushion. (What?) yup, pincushion for just 1 needle, and that one needle/pin (can you see it’s yellow head?) is to open up the tip of the glossy accents bottle, which is seen next to the drawer. Let’s take a look to the left and a step back. My frame for hanging nearly finsihed cards. My ikea drawers with many of my supplies, two boxes which I need at hand. (It started out as one half box, then it got one full box quite soon, and now in the past month somehowe another box moved in there.) You can see into the second drawer, here are my other (big) inkpads, the little ones are in another drawer with the chalks. 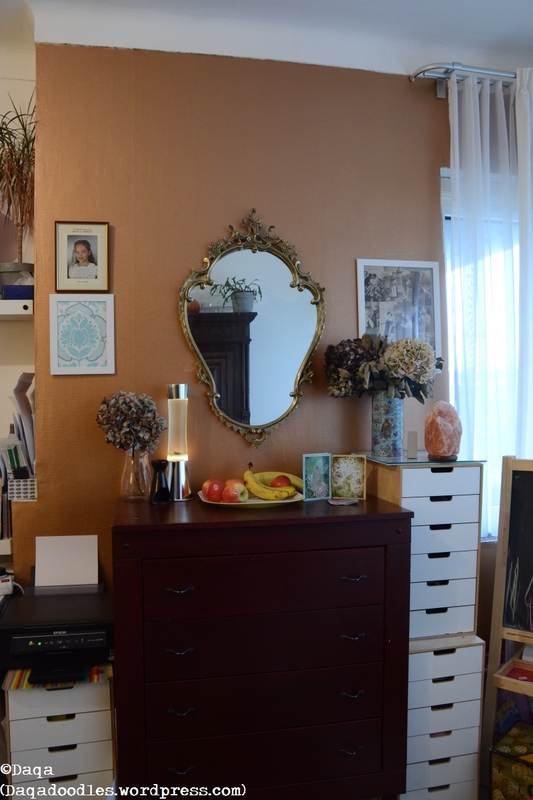 Do you see the dowels sticking out of the drawer? That is my solution to nosy babies. You can imagine that having craft supplies in the same room where little kids play isn’t very safe. (health, furniture, money etc..) I wanted a simple solution so my son (at that time I only had him) couldn’t open the drawers. I’ve had the drawers for quite a long time and I had always planned to paint/decorate the sides but never done it yet. Because of this I didn’t feel bad about drilling holes in them. My embossing powders (I still want some bright yellow!) and my “lock” solutions. A hole in the side of the board and drawer, a dowel in it and it’s closed. Don’t stuff your drawers so the dowel can’t be moved in though! How to open? Take a pencil/pen/thingy, and push the dowel in. How do you prevent your kids from figuring this out too soon? Don’t open the drawers when they can see you do it. My son (aged 3) hasn’t noticed the dowels yet, so this fix still works. Now, let’s put the camera away amd tidy things up a bit. And then it really was time for bed! What was on your workdesk wednesday in November 2013. Today I want to show you three baby cards, two which I made in November last year (november 2013), and one I made after 3rd of July, because I wanted to send them a birth announcement card but hadn’t yet congratulated them on their baby which was born in March! Ok, they didn’t have my adress so I got the announcement card from my mom, but better late wishes than none, right? I am most pleased with the first two cards, although they took quite some time to make. I stamped the fairies on top and repeat stamped the leaves and acorns, masking them off with self adhesive window foil. After that, I coloured them in, I think with my Caran D’ache neocolours. The baby stamp is from Stampinback: Sleeping baby. The stork is the logo of the city The Hague, where they live. The stork is also said to deliver the babies. The colours of the city are green and yellow, so they kept in style. I like how they made it a unique and personal card. This is what I made, I didn’t make a winter scene although they have snow on the card, I made an autumn card as the baby was born in October. I made this card with the same sleeping baby stamp, and stamps from Nonsequiturstamps – Plate 101 Trees, NSPL101. On the left the self adhesive window foil, with the cut out templates. The stamps are there too. Memento and STazon inks, a remote for the tv, acryllic block, and in that metal tin for pencils weren’t pencils. I don’t know what was in there, but what is in there now is different from what was in there then, and back then it weren’t pencils allready. (Now it stores quite a few of my cutting dies). Oh right, Christmas was nearing so I made a few Christmas ornaments for cards allready. And see the card on the top right? That one I made for my father, I’ll post about it later. A furhter look down the table. A binder with stamps in it, the couch behind the table (and isn’t that a sleeping toddler on it?) – as we were preparing to move I had gotten the brilliant idea of emptying one of the living rooms so we could store the boxes in there, which meant moving the dining table to the other living room. It was a bit cramped in there though. On to the last card with the sleeping baby. The fairy is from.. can’t remember. She’s got glossy accents on her wings. Health, Wealth, Happiness, Love, Always! From Sheena Douglas – A little bit magical – Knowledge set. The embossing didn’t quite work out as intended unfortunately. But no time to make a new card or cover it up, it’s just the magic wish flowing from the fairy’s hand. I tried to use the same colours as on the birth announcement card, and (as seen in previous picture) added a butterfly at the end of the swirl to match it even more. I really liked the first two cards, and might make more of these. Use the colours of the birth announcement card, or the season in which the baby is born or other elements that I can reuse. It’s been a while since I participated in a WOYWW, but it’s about time I did again, as I made some pictures while making the card for the first Chocolate Baroque colour challange (july/august). See the end of the post for the picture of the card, and another desk- picture. (For an older desk picture, of how it was back on November, see my next post. (Yup, NEXT post. I’m not working in an entirely chronological order when it comes to blogging – I can time travel, hurray!). Hmm now what’s on there: My heat tool, a cloth, my much beloved broken and fixed water sprayer, distress inks, stazon inks, Chocolate Baroque stamp, glue, embossing ink, acryllic blocks, stamppositioner, embossing powder, an empty teacup (hurray! I emptied it! ), cuttlebug, binder with stampimages, scissors, my phone, waterbrush, another cloth – I love that one too. It’s an old rag, almost falling apart, but it’s just the right size, right absorbency, and been with me all my “crafting” life. The yellow cloth is not as good, that one is for cleaning the desk or acryllic blocks. The smudgy rag is for lifting off water / ink from cards. After having received a new stencil (clockwork from Tim Holtz) I ofcourse had to play with it, even while my kids were around. Ofcourse that resulted in them playing with it and me trying to keep things in one piece. I took some light coloured distress inks (so the inkstains on their hands would not be very intense), and having the Chocolate Baroque colour challenge in mind I took out my distress inks Tumbled Glass and Shabby Shutters. I liked the colour and stencil combination a lot, so I managed to grab a piece of cardstock for myself and started on the next project. The clockwheels were great, but I needed to add some (CB) stamps too, and I was thinking Steampunk style. I browsed through my stamps, stopped at the Steampunk Christmas set and chose the flowers from that set. Then trying out some different stamping inks (Stazon red, DI festive berries or fired brick, only embossing ink and embossing with red or Queens gold embossing powder). Wiping away the ink a bit on the holly leaves of the stamp, inking only the middle or outer leaves and restamping with the stampruler and embossing it, then colouring it with DI and water. Used colours: Fired Brick, Mustard Seed and Scattered Straw. I had a quick detour while playing with the stamps from Design by Ryn and alcohol ink, using the cover from the EZ-mount foam as base. Too bad one side was too smooth, luckily the stamps were sort of symmetric so they still fit on the piece of backing. Then choosing the flowers which would go on the card, and the layout. I had intended for a small flower on a big flower at first, but liked 2 big flowers twisted in eachother too. Only that would cover too much of the stenciling. A small flower on a big flower would cover the lovely gold embossed gear too much. So only 1 flower per clockwork. https://www.youtube.com/watch?v=j7eFYtkOiXo Nitin Sawhney – Street Guru. In it, there is a line: Time is the essence of life. It just fit my mood, so there we are, the sentiment. Stamped in black, and distressed with aged paper and scattered straw. Last were the butterflies, I wanted to add some more blue to it, so stamped the CB butterfly from the summer fairy set several times. I kind of repeated the process for the flowers: clear embossing, black embossing, silverywhite embossing, no embossing. Coloured them with Distress inks and Caran D’ache Neocolors. Oh and I used glossy accent on some of them. Then I remembered the small wooden laser cut butterflies I had recently bought at the Xenos. I applied some gesso to it, and coloured them with the Caran D’ache Neocolors and added glossy accent to three of the prettiest. The outline of the stencil is a bit wobbly/aged, I liked that so I cut out a “frame” equally wobbly. The basecard is straight. I coloured that with brushed corduroy, vintage photo and a little bit of black sooth and a tiny bit of real coffee. (There are more crafters out there that dip their brush in their drinks when in need of just a tiny bit of water and having no water around…right??) I wanted it to be brown to be a bit more clocklike, like an old standing clock (I know that is not the right english word for it, it’s the literal translation of the dutch word, but I think you know what I mean). WOYWW 231 – What Workdesk? 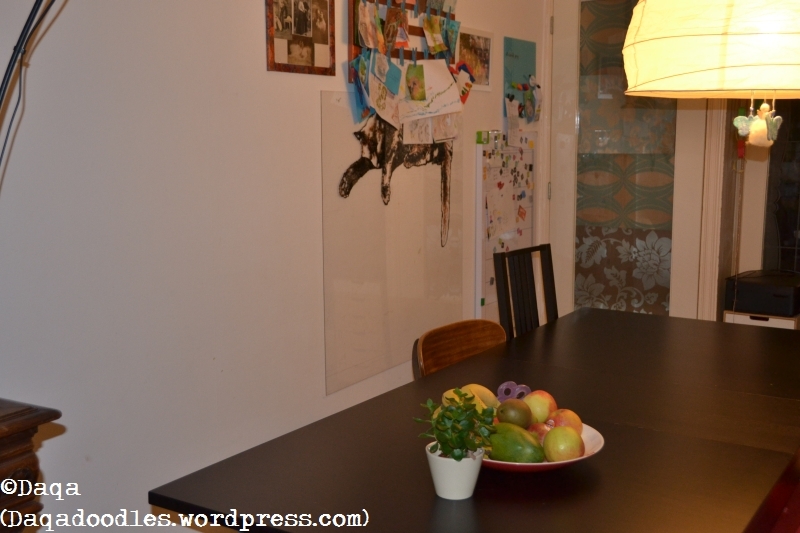 WOYWW #231 – What workdesk? It’s GONE! (A creeper came near and it exploded?). Sorting out stuff takes up lots of time and energy! I did do a bit of crafting,I printed a slide my dad made 30ish years ago on fabric (a bit smaller then A4, it was glued on an A4 sheet for printing with my epson stylus SX235 printer) – I still need to finish the procedure (ironing, drying, washing in water and vinegar to set the ink). (Not all ink is suitable for this, some will fade when washing). I’m not sure what I am going to do with the fabric, I think I’ll use it to decorate an old ugly binder/folder thingy (I don’t know the english word). My sewing skills are horrible, and I’ve thrown out my old and only half working sewing machine, so sewing is kind of not an option. Furthermore, I’m making a series of minecraft Christmas cards. Minecraft is a popular game (which I do play/have played also) – you can dig, build, explore. And there are the creepers. They creep up on you and go Ssssssssssssss……. BOOOOOM! (yes, they explode, leaving behind a crater and you being dead if you’re unlucky). The Sssssss sound is reason for many a panicked reaction, frantically trying to get away from the sound, to safety. The creeper is very well known, even amongst non gamers. I thought it would be fun to make some geeky Christmas cards (and sell those if possible), of creepers with Christmas embellisments. I made the creepers by printing an image several times and cutting out squares (it’s built up out of squares), and then using those as masks. I wanted to make it directly on the card, but I messed up when I used the unfolded cardstock: I stamped on the wrong side. So I decided those will be cut out and matted onto another card. That is why the other side of the cardstock is also stamped, it will be cut out. I’d love to hear your suggestions as to Christmassy punchlines for the creeper card! 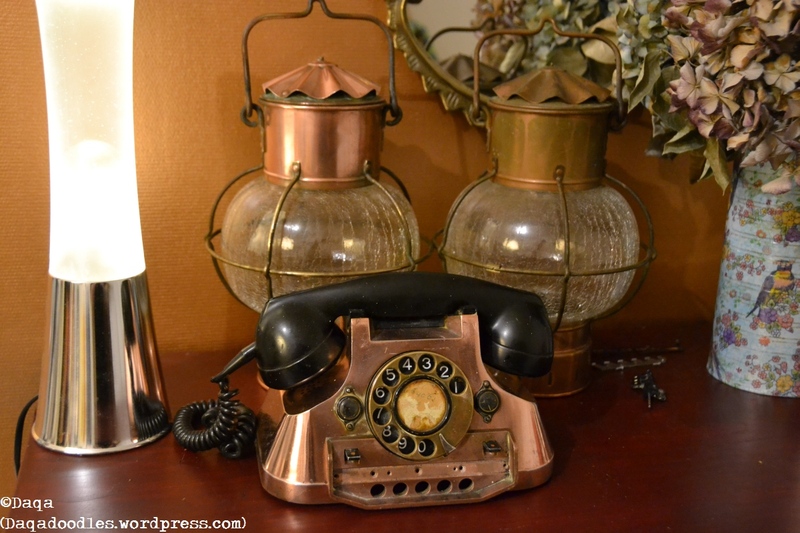 Actually it’s different now, as it has two copper lamps and a copper phone on it. 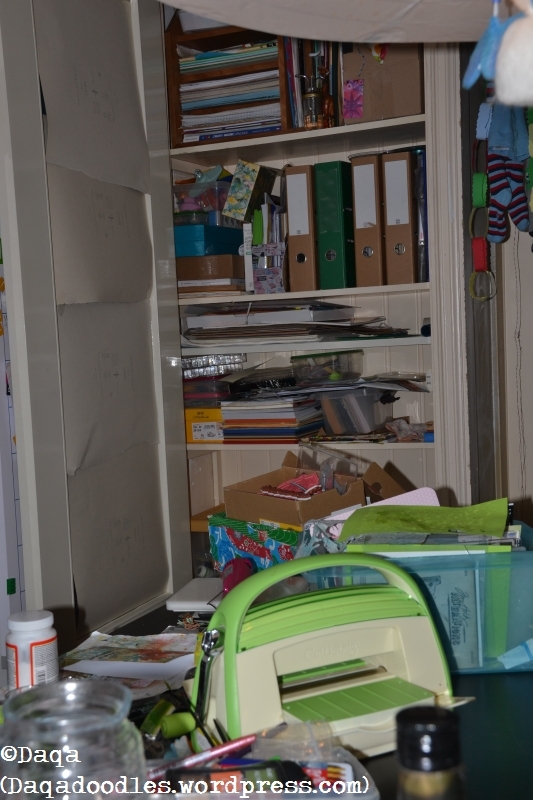 Also the 3 chests of drawers are gone, and the stuff on top of the cupboard which is seen in the mirror is gone. The big cupboard with drawers also contains mostly crafting stuff. It is a bit of a showcase place though. 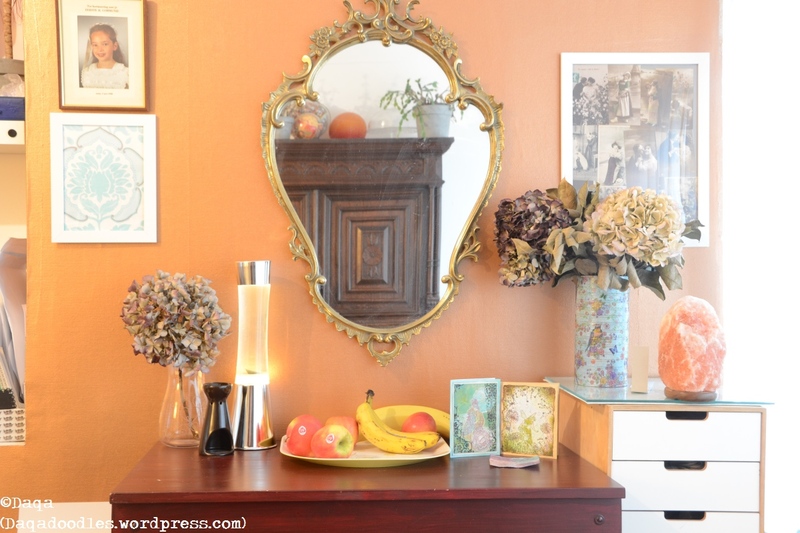 I love the mirror, love the lavalamp, like the dried flowers (Don’t tell anyone I do, I only like THESE dried flowers). And I love bananas. I still love the lava lamp, it’s fun to watch. 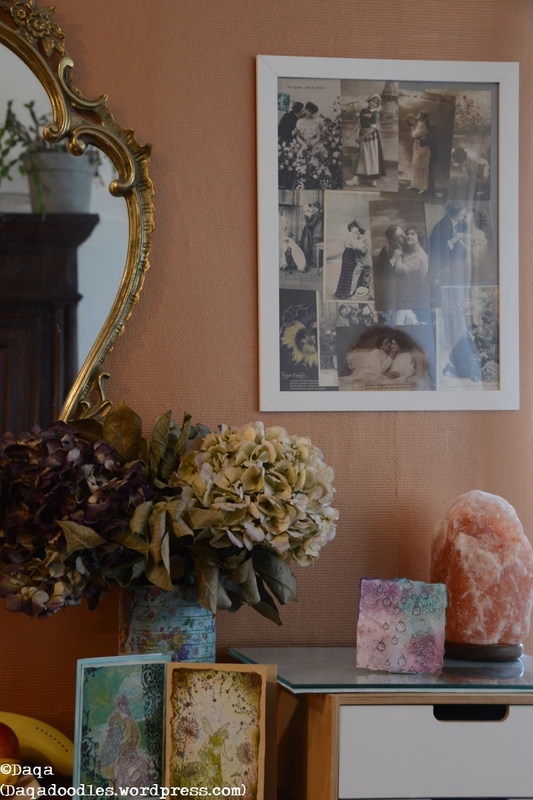 My “pressing station” and a frame with postcards from French Kissed Postcards, which are in split in new frames now (see previous post Copper Kisses). 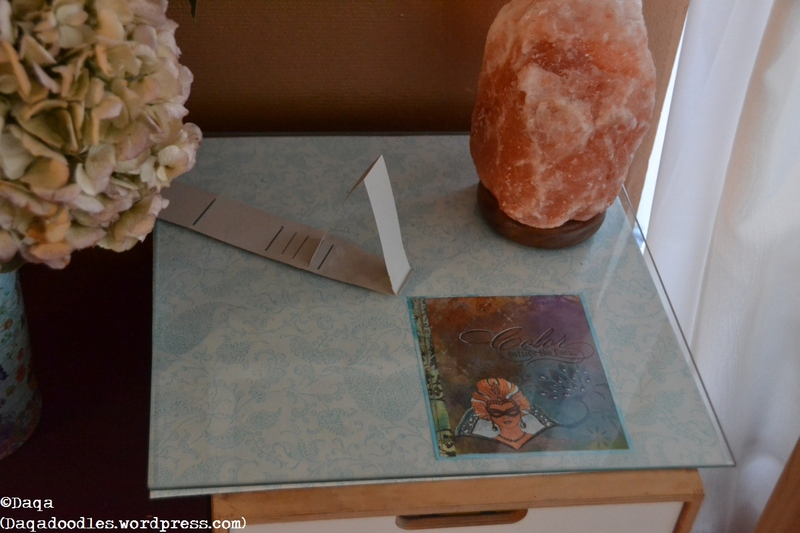 The pressing station exists of a spare glass plate (for inside a cupboard) with the cardboard from the packaging (I glued a wallpaper sample on it so it looks pretty) and a salt crystal lamp without the lightbulbfitting and wire. (I still need to replace the lightbulb, it’s broken, and therefore the fitting is not in it). Also seen is my card-stand thingy. I found that the light is better if the card is slightly tilted, but ofcourse it won’t stand on it’s own so I made this simple ugly thing. Good thing it’s not visible on pictures. 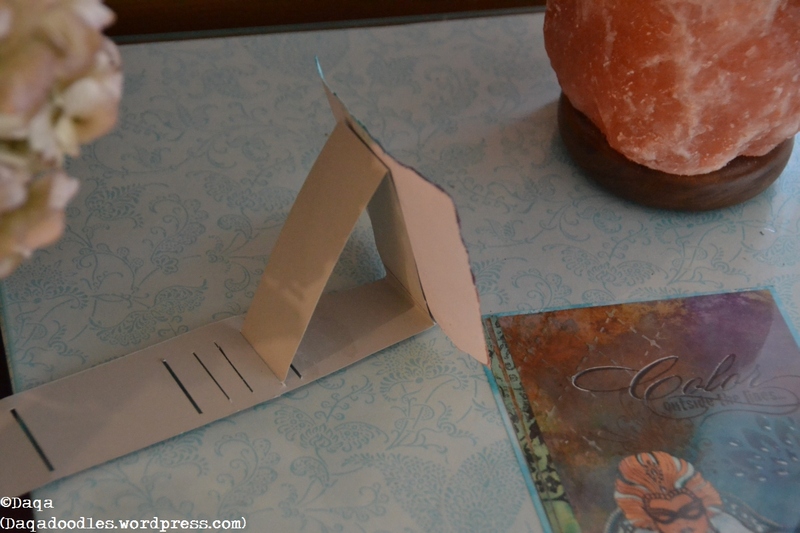 Oh, and the purpose of my pressing station is to reflatten cards or papers. Just put it beneath the glass plate, put the heavy salt lamp back on top and leave for a day or so. Papers come out almost completely flat. Ofcourse, with all the moving of stuff I’ve done, the pressing station has moved to. Or actually, has been “dismantled”- I still have to find a new spot for it. One polished and one unpolished ship lantern and a copper telephone. The copper telephone is complete, but I took some parts off to clean it better. It still has to be cleaned more, but it’s ok for now. I love the ship lanterns, although I doubt if they really were used on a ship – I think these were made and meant for in a house. Maybe one day we’ll reinstall the wire and hang them, but for now, I like them on that cupboard. One more thing I’d like to mention: In my previous post preparations (and a birthdaycard for a 5 year old) I showed the card I made for that boy. We also gave him a toy bus, and at the last moment I decided to add some coins to the card. I don’t like to give money to a child, but I know children love getting money, or coins. Not paper money, but coins they can count. The boy who these gifts were for is lightly autistic, and has a strong opinion about toys he does or doesn’t like. We were told he liked public transport things, hence the bus and the train-themed card. The toy was very well received, he and his younger brother play in turn with it, they both love it. He was delighted with the coins, counting them several times a day. And the card? He loves it! He even insisted on taking it to school to show his teacher the next day, and later that night was in tears because he couldn’t find the card when he went to bed, and he wanted to take it to bed with him. He had been walking around with it 2 minutes prior to that, so it wasn’t far gone – it was actually lying on a cupboard near his bed. This moves me. How a child can be happy with simple things like that! I’m so glad I decided to also make card for him. Usually, when we go to a kids birthday, we only bring a toy, it is not a custom in this part of the Netherlands to also bring a card. You mail a card, bring a gift. So, it’s half past twelve now (00:30), and the table hasn’t changed much. So here it goes, my first WOYWW. Debbie (nickname Daqa); the partner of a wonderful man; mother of 3 kids (2011, 2013, 2014); sister; aunt; Dutch; dog and cat lover; gamer (or should I say geek? ); IT-consultant living in Bunde, Zuid-Limburg, The Netherlands. I love to try out different crafts, but mostly, I like to make paper things. My blog is about crafting, and my life and things I find interesting. (pictures I've taken, events in my life and things or ideas I find worth thinking about). I hope you enjoy reading my blog! Still want to know more about me and my blog? Click the image! Dig down into the dusty archives. Enter your e-mail adress and click "Follow" to follow my blog via e-mail. They've got robot and alien stamps!! And lots lots more. I made top 3 at the Craft Room Challenge blog! I made Top 3 with "A mermaid's treasure"
Bits of Freedom groeit! Steeds meer mensen steunen ons en die willen dat laten zien. Hoog tijd om onze merch in een nieuw jasje te steken. We zijn op zoek naar een vormgever die ons hier op vrijwillige basis bij wil helpen. Dus: jouw skills inzetten voor internetvrijheid? Lees gauw verder! Don't want to be tracked or your searchterms stored?